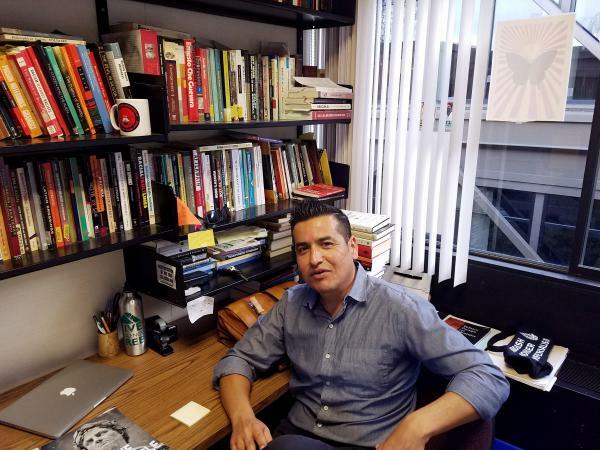 Professor Albert Ponce received death threats after giving a talk on white supremacy in the United States. 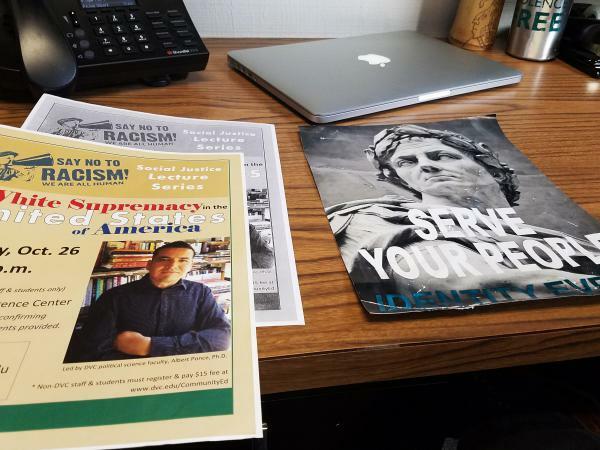 Flyers for Ponce's talk about white supremacy in the United States sit next to a flyer for Identity Evropa, a white supremacist group. Ponce teaches political science at Diablo Valley College, a community college in California's East Bay. It all started in October when he was invited to give a public lecture on campus on an area he specializes in: race and politics. In the speech, which was filmed, he called the United States "a white supremacist, patriarchal, heteronormative, capitalist system." He also mentioned Karl Marx in passing, praised civil disobedience and referred to a white supremacist in the White House. The result: attacks on Facebook and threatening voice messages and emails. Colleges are meant to be a home for free inquiry. But these days, not all professors feel that freedom. Across the country, in the past year and a half, at least 250 university professors, including Ponce, have been targeted via right-wing online campaigns because of their research, their teaching or their social media posts. Some have lost their jobs, and others say they fear for their families' safety. Ponce says his ideas, in context, are "not controversial at all" in his circles of academia. For example, when he talks about white supremacy, he says, he is talking about a system of power, not about individual white people. Josh Cuevas, an associate professor in the school of education at the University of North Georgia, came under inquiry from his congressional representative after getting into an argument on Facebook about President Trump and voter turnout. Eve Browning, the chair of the department of philosophy and classics at the University of Texas, San Antonio, was targeted, as was her entire department, when a student surreptitiously recorded a disciplinary conversation that touched on his negative comments about Islam. Laurie Rubel, a professor of education at Brooklyn College, published a National Science Foundation-funded research paper about race and mathematics education. Rubel tells NPR that she was looking at how to support high school math teachers who teach in hypersegregated urban schools, in part by being critical of the concept of meritocracy. The on-air take of Fox News commentator Greg Gutfeld was: "A math professor ... claimed that merit-based education is ... a tool of evil whiteness." George Ciccariello-Maher, an associate professor of politics and global studies, was placed on leave and ultimately resigned from Drexel University in Philadelphia last fall after tweeting, "all I want for Christmas is white genocide." "White genocide" is a white nationalist conspiracy theory; Ciccariello-Maher says he meant to be satirical. People on the right don't have a monopoly on threats to free speech or academic freedom. Campuses like the University of California, Berkeley, the home of the Free Speech Movement in the 1960s, have become national flashpoints with sometimes violent responses to conservative speakers. And professors have sometimes been subject to attacks and harassment from the left. Bruce Gilley at Portland State University in Oregon, for example, was attacked online and over the phone when he published an academic paper titled "The Case for Colonialism." His paper on colonialism, he tells NPR, argues that "there is a wealth of evidence ... that shows quite overwhelmingly positive benefits in terms of democracy, public health, human rights." He calls the response "a mass global mob." The article was withdrawn after threats of violence were made against both him personally and the editor of the journal that published it, Third World Quarterly. Experts who study the spread of hate speech online say there is a difference in patterns of online harassment between the right and the left. Attacks from the left tend to originate from within campus communities. Thousands of self-identified academics, for example, signed online petitions calling for Gilley's article to be retracted. On the right, though, a network of outside groups and sites has mobilized against academics. Their views range from libertarian to conservative to white nationalist. Sites such as The College Fix and Campus Reform pay student reporters to contribute stories such as: "Meritocracy is a 'tool of whiteness,' claims math professor" (Campus Reform) or "History professor calls for repeal of Second Amendment" (The College Fix). Jennifer Kabbany, editor of The College Fix, told NPR that the site's purpose is to train future journalists, not to foment hate. "The College Fix has publicly denounced any vile emails that a professor might get," she said. "I'm sorry if professors received that kind of backlash." In reference to Ponce, of Diablo Valley College, she added, "It appeared the lecture was not balanced and didn't do academic inquiry and debate justice." The College Fix is run by the Student Free Press Association. The association has had Education Secretary Betsy DeVos' son listed on its board of directors and is funded by an anonymous conservative donor fund. Campus Reform is a project of the Leadership Institute, a conservative think tank. Professor Watchlist, which lists more than 250 professors who advance what it calls a "radical" left-wing agenda, is maintained by Turning Point USA, an on-campus group that has been labeled "alt-right." Campus Reform and Professor Watchlist did not respond to requests for comment. TheRedElephants is a pro-Trump "alt-right media collective" founded in November 2016. Founder Vincent James Foxx has reportedly denied the Holocaust and been accused of urging violence at rallies. The site posted an edited video of Ponce's talk on YouTube with commentary calling it "Marxist, Communist, disgusting rhetoric that they spew in these classrooms to indoctrinate these children." It used the video to kick off an initiative called "Film Your Marxist Professor." The administrator of the "Film Your Marxist Professor" Facebook page, who gave his name as Aaron Burr, told NPR via Facebook message: "We receive around 10 submissions per day. Our goal is to stop the anti-white and anti-American rhetoric that is being spewed on college campuses all across the country." From these specialized sites, content travels to alt-right media sources like Breitbart and Infowars and neo-Nazi sites like Stormfront, and then, sometimes, to Fox News and the New York Post, CNN and other outlets. Meanwhile, harassment is coordinated out in the open on anonymous, uncensored forums like 4chan, 8chan and Reddit, where self-identified "trolls" uncover and post people's personal information, known as doxing, and try out strategies of attack. Cuevas at the University of North Georgia obtained screenshots of the 4chan forum on which people were fabricating social media posts in an attempt to paint him as anti-Semitic and racist or, alternatively, as pushing anti-Trump views onto his students. "Their stated goal was to get me fired," he says, but he fears that is not the worst of it: "Georgia had just passed the campus carry law [for firearms], and what worried me was a lone nut case." Ponce says he sees a fresh wave of abusive calls and letters every time a new media story hits. He has gotten letters in the mail, emails and Facebook messages, and his colleagues and administrators have gotten calls and emails. He has found his personal information on a Hungarian right-wing website and gotten calls from South America. He, like other professors, has called the police, but the messages keep coming. Most troubling, he says, are "the real threats against my family" and "pictures on the Web of my 9-year-old daughter." He and his wife are trying not to park their cars in the same places every day, peek out into the street at night and warn their daughter not to touch the mail. Hans-Joerg Tiede of the American Association of University Professors says no matter what side you're on politically, it's clear that academic freedom is under assault, as it has been many times in the past. "There have always been instances of faculty being targeted in particular for what they say, for what they teach," says Tiede, a former computer science professor at Illinois Wesleyan University. Anti-communist academic blacklists go back to the 1930s, and professors were targeted for taking desegregationist stances in the 1960s, he adds. The difference today is that momentum builds very fast, and it doesn't take time to reach far-flung destinations. The AAUP has been tracking this latest wave of targeted harassment and issuing recommendations for policymakers. Jessie Daniels, a professor of sociology at Hunter College, is among scholars who say the rise of the Web and social media have given right-wing groups new means for targeted harassment and for spreading their ideology. "With the rise of the popular Internet, everybody's an expert," she says. "White supremacists really saw that as an opportunity." In contrast to the sometimes-violent confrontations on campus around speakers like Milo Yiannopoulos, NPR was not able to find a case of an online harassment campaign, targeting a professor for his or her work, that resulted either in violent threats being carried out or in any legal action against the perpetrators. What concerns experts like Tiede is the potential chilling effect on researchers, especially untenured graduate students and adjuncts, who might fear broaching any topic that could touch off a firestorm. But as this pattern of behavior becomes better known, professors like Rubel and Ponce are no longer keeping quiet. They are fighting back. Rubel responded by posting many of the foul voicemails and emails and messages she received on Twitter and Facebook and by collecting statements of support from colleagues. "I think they messed with the wrong person," she tells NPR. For his part, Ponce, who does not have tenure, and his colleagues are urging the board of governors of his community college's district to adopt a resolution in support of academic freedom, making clear that the colleges will stand behind its scholars no matter how provocative their work, as long as they are grounded in research and evidence. "In a democracy, these places of higher learning should be the spaces where we engage in a rigorous scholarship, not necessarily an ideological one," Ponce says. College, he says, is the place for a quest for truth, not merely opinion. Well, this week NPR is examining free speech in a digital age. Today we look at college campuses. In the past two years, more than 250 university professors around the country have been the targets of cyber harassment campaigns. Some have lost their jobs. Others fear for their family's safety. 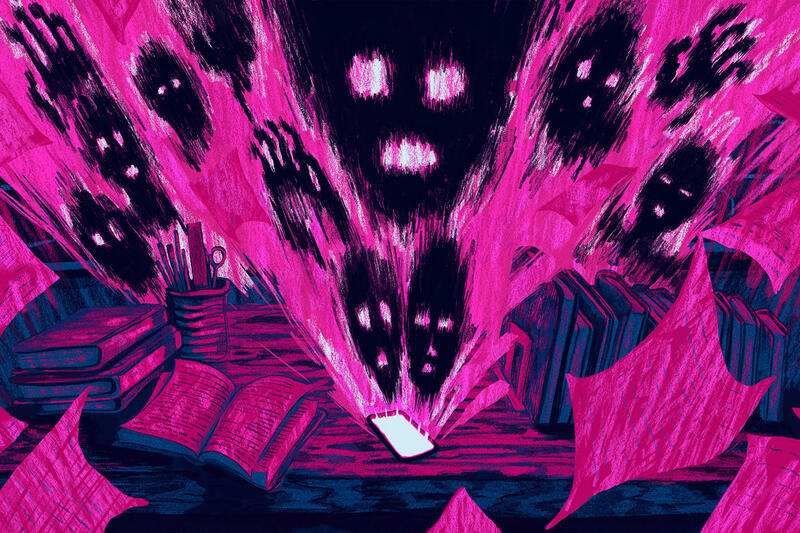 Anya Kamenetz reports on how professors are pushing back against the cyber mobs. ALBERT PONCE: I see my light flashing there. That's all the calls I've been getting. COMPUTER-GENERATED VOICE: You have 20 unheard messages. ANYA KAMENETZ, BYLINE: Professor Albert Ponce teaches political science at Diablo Valley, a community college in California's East Bay. For the past few months, his answering machine has been filling up with threatening messages like these. UNIDENTIFIED PERSON #1: Albert Ponce, you are a piece of [expletive] gutter slug that needs his neck snapped, OK? Call me if you need me. I'll do it for you. UNIDENTIFIED PERSON #2: [Expletive] Race-baiting [expletive] piece of trash. KAMENETZ: It all started last October. Ponce was invited to give a public lecture on campus about his academic specialty, race and racism. PONCE: So we begin with the fact that we exist in a white supremacist, patriarchal, heteronormative, capitalist system. GREG GUTFELD: A math professor at Brooklyn College claims that merit-based education, meaning rewards linked to hard work and talent, is a tool of evil whiteness. KAMENETZ: The right doesn't have a monopoly on these attacks. Colleges like UC Berkeley, the home of the Free Speech Movement, have erupted with violent responses to conservative speakers. And professors have sometimes been subject to equally intense harassment from the left as well as the right. Bruce Gilley at Portland State University published a paper in an academic journal last fall titled "The Case For Colonialism." BRUCE GILLEY: There is a wealth of evidence in particular that's come out in the last 10 years that shows quite overwhelmingly positive benefits in terms of democracy, in terms of public health, in terms of human rights. KAMENETZ: The paper incited liberal outrage. GILLEY: I had never experienced that kind of mass global mob. I took fright, frankly. UNIDENTIFIED PERSON #3: Marxist, communist, disgusting rhetoric that they spew in these classrooms to indoctrinate these children. KAMENETZ: They used it to kick off an initiative called Film Your Marxist Professors. Meanwhile, websites Campus Reform and The College Fix pay students to report from classrooms. These tales spread to alt-right media sites like Stormfront and Breitbart and to mainstream outlets like Fox News, the New York Post, even CNN, while self-identified trolls uncover and post people's personal information and concoct false accusations. But some of the academics are fighting back. Albert Ponce's faculty senate is drafting a resolution that he hopes will be adopted by the District Board of Governors to make clear that the colleges will stand behind scholars with provocative beliefs. PONCE: We can't just say anything because we are professors producing academic research. We're able to make claims - maybe provocative, very provocative to many - but we ground it, and we back it up with evidence. KAMENETZ: He is resolute. But the harassment is taking a toll on him and his family. PONCE: But the thing that's most troubling is, you know, the real threats against my family. And that's when, you know, the doxxing of, you know, pictures on the web and of my 9-year-old daughter. KAMENETZ: They are afraid for their lives. PONCE: All it takes is one. KAMENETZ: He and his wife try not to park their cars in the same places every day, and they scan the street from the window at night. What have you told your daughter, anything? PONCE: No, not yet. I'm trying to shield her as much as possible.